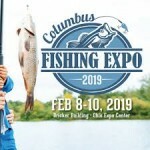 The Crappie Psychic is very excited to be attending the Columbus Fishing Expo in Columbus , Ohio on February 8-10! Located at 717 E 17th Ave. The Crappie Psychic will be there with all of our awesome products and show specials!!! !